I had thought that after JJ’s surgery in Indianapolis, our lives would quickly calm down with only an occasional blood draw, CT Scan, and doctor’s visit. However, last week we had only one day in which we didn’t have to take JJ to an appointment. Monday was his blood draw, Tuesday he got his staples removed, and Wednesday was an appointment with his oncologist. The days of Chemo and surgery have left us very, very exhausted, so I kept reminding EJ and JJ that we needed to talk to the oncologist about how often JJ was supposed to have blood tests, when did he need his CT scans and how were we to schedule them, and when were we to schedule appointments to get JJ’s port flushed. We remembered to talk to the oncologist about everything except the port flushing. Bummer! So I called and left a message and the nurse got back with me on Thursday and I made an appointment for him to have his port flushed on Friday. 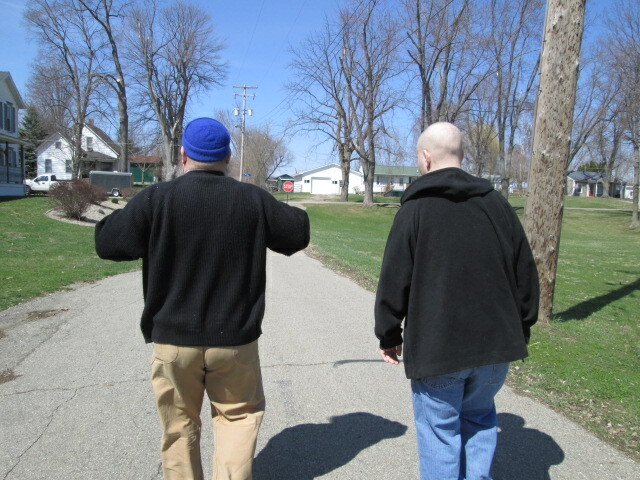 EJ and JJ (and me) taking a walk. JJ and I have been so tired that after EJ left for work each day, we both fell asleep for a couple of hours. I had to go shopping on Friday because I was out of Shabbat candles. I was so tired that I didn’t think I would have the energy to go shopping, go to the Cancer Center, and then come home and clean the house and prepare for Shabbat, so I suggested that EJ and I divide tasks. I went shopping in the morning and stayed home to prepare for Shabbat while EJ, who had Friday off, took JJ to the Cancer Center. It worked out well. I had my tasks finished by the time they returned home so we all went for a walk around the block. We try to take JJ for a walk everyday so he can regain strength. Saturday we all rested. We studied and talked and read. Balloons floating like colorful jellyfish. 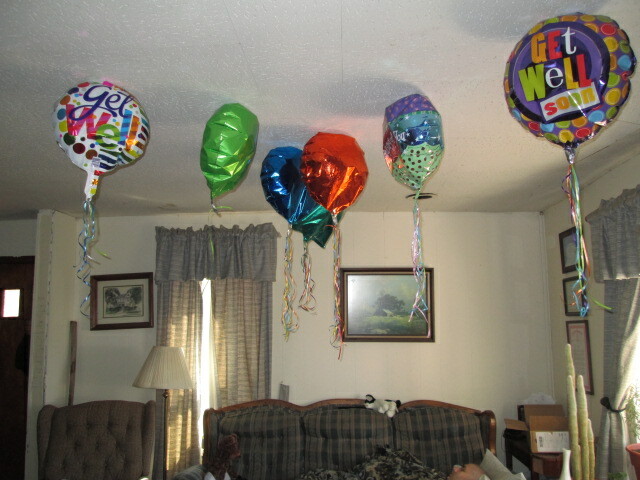 After JJ’s surgery, my friend had a bouquet of balloons delivered to his room. The balloons were attached to a stuffed kitten by ribbons. We brought them home with us but noticed that Luke was chewing on the ribbons so the other day I cut the ribbons from the stuffed kitten and let them float near the ceiling out of Luke’s reach. It’s of fun seeing all those balloons all over the living room ceiling–like a floating forest. EJ and JJ think they look like colorful jellyfish. Neither EJ or I slept well last night. I couldn’t sleep because I was wondering how we could get the dead tree cut down when we are all so exhausted. This afternoon EJ and I worked in the yard. He started cutting down the dead tree. He could only work for an hour before the battery ran down on the cordless electric pole saw. He figured he could work on it for an hour every day. The work we did today. Rikki-Tikki-Tabby is sitting in the path. He likes to help me when I work in the garden. After he finished working on the tree, he came out to the side yard and helped me. My garden had filled the whole area between the fence and the house with a path running through it. I decided to make a sort of garden island to the right of the path and mow between it and the house. This will make the bird feeders and cherry trees accessible so EJ doesn’t trample my flowers like an orc. I hope. The “island” is sort of odd-shaped because I didn’t want to disturb the growing flowers. It was a very difficult task clearing the area between the island and the house because there was ivy growing everywhere. 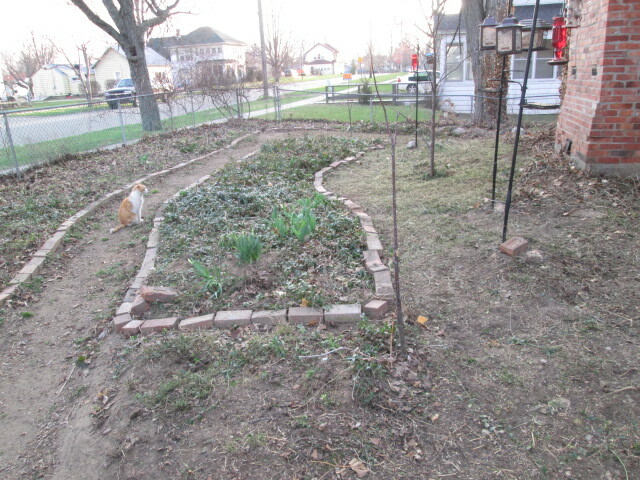 I yanked up the ivy, pulling with all my might, and sometimes using the garden pruners. Then EJ mowed the area. He mowed over ivy I couldn’t get up, and there was occasionally stones hidden in the ivy, and rough ground. I think it looks neater without the tangle of ivy next to the house. I found a hummingbird migration map on the Internet a few weeks ago and I have been following the progress of the hummingbirds as they move north. I noticed that the hummingbirds are now in our area so I put out some hummingbird feeders. They are very pretty red antique-looking glass bottle feeders. I can’t wait for hummingbirds to find it. I also want to plant flowers that will attract hummingbirds. Our work outside was pleasantly interrupted when a neighbor stopped by to ask about JJ. We talked to her for quite a while. She let us give lovings to her beautiful golden retriever. After she left, EJ finished mowing that part of the yard. He had considered mowing some of the other parts of the yard, but we ran out of energy. We have a lot of different garden areas in our yard. We will work on them little by little until our yard looks nice. We came into the house and I prepared a bag of trash to take out to the large trash can near the garage. EJ offered to take out for me. He left the house and didn’t return and didn’t return and didn’t return. I figured he was talking to a neighbor who lives beyond our garage. I was right. EJ told me that this neighbor offered to take down the dead tree for us, using his bucket truck. He will be able to do it in one morning and without causing damage to our garage. He also offered to dig holes for the new fence poles using another of his cool machines. YAY. We will just need to get new fencing to replace the fence that was crushed when part of the dead tree fell on it last autumn. We will probably have to cut the dead tree into firewood-sized pieces, but at least the tree will be down. That is a relief to me. I have been worried about more of the tree falling and hurting our neighbors, who often play horseshoes in that part of their yard. After we finished our yard work, I made popcorn. I really do make the best popcorn ever, and I figured we deserved the treat. Then we spent relaxed. I think we will go to bed early tonight since we slept so badly last night. You are correct, Simone! I am beginning to write more about our garden than JJ, which is an indication that he is getting better. Even though it wasn’t always fun to go to the Cancer Center in bad weather, I am glad that JJ had Chemo in the winter so that we can enjoy the Spring and Summer months. It would have been difficult to remain inside for all those hours if the weather had been nice! We have always had some hummingbirds but I hope with the flowers and feeders to attract them we will be able to see them better. They zoom so quickly that it’s difficult to take pictures of them, but I will do my best for you, Simone. What a great neighbor for you to have at this time, you will have peace of mind when that tree stands no more and yes we will miss the shade. We are doing the same on our property, such a winter we have been thru. Hope you had a blessed Easter, such a gift given to us all, we are all truely blessed by His saving grace, our love and prayers to all. We have a lot of shade in our yard and the tree has been dead/dying for quite a while,so I will not miss it. We DO have awesome neighbors who will take the tree down for us.